At Kingsway Dental Centre, we focus on prevention to keep you healthy and work with you to restore your dental health, when necessary. The foundation of oral wellness begins with healthy gums. Gum pain can be pervasive, permeating everything we do and making life difficult… and painful! According to the Canadian Dental Association, seven out of ten Canadians have periodontal (gum) disease. Simply put, periodontal disease is an infection in your gums. You may get periodontal disease because of certain medications or because of neglected oral hygiene. Periodontal disease is dangerous because it not only puts your oral health at risk, but also your overall health. Scientists discovered a link between periodontal disease and systemic illnesses including heart disease, diabetes, and cancer. In fact, when you have gum disease, your risk of sudden death due to a heart attack or stroke increases dramatically. While scientists are still learning about the link between periodontal disease and other illnesses, we do our best to restore your health by eradicating any sign of infection and assisting you in the development of a continuing care regimen so you remain infection free. We perform diagnostic testing in our Edmonton dental office. We determine the health of your gums using a measuring device. This painless procedure measures the millimetres between your gums and teeth. When your gums have pocketing, it allows bacteria to collect and can cause gum disease or decay below the gum line. We also use x-rays to determine the health and density of your bone. If you have bone loss, our x-rays will help us diagnose and determine how to best treat you. We treat periodontal disease with focused cleanings that target infection. Our hygiene team is highly skilled and very gentle. We approach treatment comprehensively and we educate you so that you know exactly what it will take to stay on track. 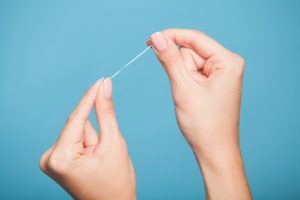 Once we gently remove plaque, tartar, and bacteria, both above and below the gum line, one of our dentists may recommend follow-up appointments, medication, or specialized care to ensure the infection heals properly. At Kingsway Dental Centre, we may use a soft tissue laser to assist in the treatment of periodontal disease. Lasers are efficient surgical tools that provide precise treatment and promote healing. If you have some of the symptoms listed above or believe you may have periodontal disease, call our Edmonton dental office to schedule an appointment with Dr. Jim Haymour, Dr. Everett Postill, or Dr. George Laschuk. Our dentists are both gentle and thorough in our treatments and look forward to helping you get back on track with your dental health.